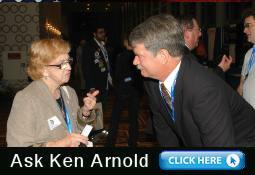 My name is Ken Arnold and I am seeking election to the position of United States Congressman representing the constituents of California's 46th Congressional District in the November 2nd 2010 general election. Please take a few minutes and peruse my website to get a better understanding of who I am and why I want to serve as your Congressman from the 46th Congressional District. You should also consider this website your direct link to me, as the most current campaign/election news and information will be posted here. You can also sign-up to automatically receive my campaign email alerts. I also want to hear your issues, concerns and thoughts. Passionate about public service, I am now asking for your support as the state party endorsed candidate for this office. Stay informed. Sign up to receive our campaign news and event calendar.